I found this great treasure hunt idea at Hubbard's Cupboard. 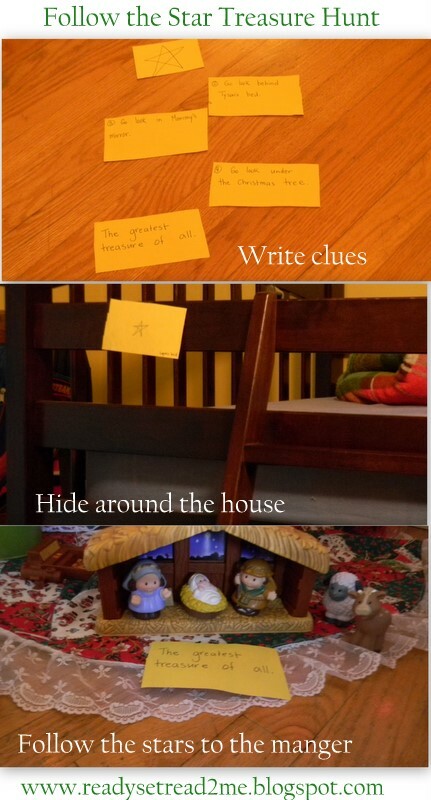 It's a fun star treasure hunt that worked great as an introduction to the story of the wisemen who followed the star to find Jesus. 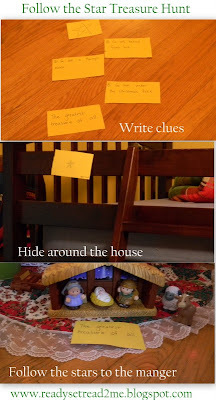 Before the treasure hunt, I prepared 5 cards with clues to place around the house. The last clue "The greatest treasure of all" was placed in our nativity set which was under the tree. Consider using words that define spatial relationships like up, behind, in, under. I gave the boys the first clue, and off they went. They were so cute because they had trouble finding the clues even though they weren't really hidden. After we did the treasure hunt, I told them that there were some other men who followed a star to find the baby Jesus. I've shared a few books during the countdown that deal with the biblical account of the Christmas story. One more that we enjoy is Twas the Night: The Nativity Story by Melody Carlson. This is a really cute version of the Christmas story as told in Luke 2. The rhyme and clear illustrations make it a great choice for toddlers and preschoolers. 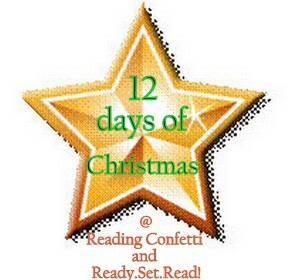 This is Day 12 of the 12 days of Christmas at Reading Confetti and Ready. Set. Read! We hope that you've found some ways to weave literacy into your Christmas celebration. You can find all of our book picks and crafts, activities, and snacks on my 12 Days of Christmas Pinterest board. Come back tomorrow for a wrap up of all of our crafts, activities and snacks. My kids would really love doing this. Bookmarking it! I'm visiting from We Teach, though the link you shared was actually for a previous post. What a cute activity! I love watching kids hunt for something that is in plain sight! Truly charming, Jackie, and love the way you wove books in too! I love treasure hunts! I think this idea can be adapted for many different stories. Most public schools can't mention Jesus very often, but could probably use a non-religious story!